Facebook doesn't allow us to access their web version on Android Smartphone. It'll automatically redirect you to the mobile version. It's not that Facebook is forcing us to use only device specific version. But to provide you a better experience of Facebook, developers have made it responsive according to the device you're using. One more reason of why FB doesn't allow it's web version on mobile is that extreme amount of people are not using high-speed Internet connection. So literally you won't be able to operate Facebook desktop version correctly. But sometimes we might need to take advantage of Facebook' full desktop website on Android. As you can't use all its features on the android version. There are some simple to use methods which will force your browser to open Facebook full site. I have mentioned 3 ways below, although all of them work fine if in any case one of them doesn't work for you then simply go for next one. 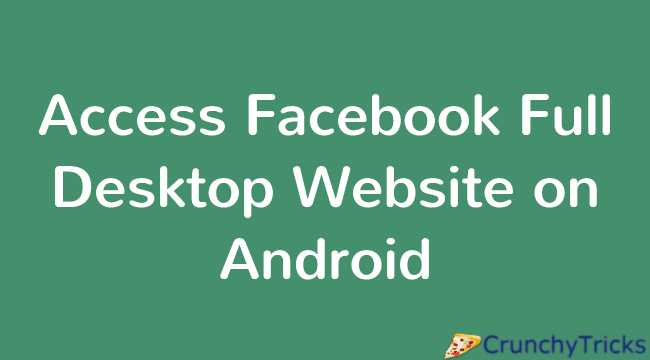 This is one of the simplest method to load Facebook full desktop website on your android phone. We can say that it's an official method from Facebook because the URL which we're going to use is FB's own URL. Just open your browser and enter this URL http://www.facebook.com/home.php. Don't forget to add 'www' in front of facebook. It'll open up as a mobile website if you're not logged in, once you've logged into the Facebook, you can see full version of Facebook. Launch your web browser, you can access it from your Smartphone's home screen. Now simply input facebook.com in the address bar and that's it. You're done. This is another great working method if you're using mobile version and wanna switch to desktop meanwhile. Scroll to the end of the menu and there you can see an option Desktop Site, simply click on it and that't it. Note: - It is always advised to rotate your screen while accessing desktop website on your mobile. Landscape mode will give a better view of text and image of the website. To use landscape mode simply select rotate screen notification bar. So readers this was all about how to load facebook desktop version on your android mobile. Hope one of the method would work for you. If you're facing any inconvenience or having any doubt or query then feel free to leave a comment below in the comment section. I've been using full facebook site by clicking on the desktop option but sometimes it doesn't always load. Not sure why but I'll try the other methods you suggested. Annoyingly, Facebook has removed the "switch to Desktop" option from the mobile site's options menu. When I try switching to desktop from my browser's options, I'm presented with a "larger" version of the mobile site. It's bigger and uglier but it's still the mobile site. The URL still has m.Facebook.com as well. The most frustrating of all of this is that I have to switch to desktop view to be able to use necessary features of Facebook because a lot of features just aren't there. Now, as if to rub salt into the wound, once I manage to trick Facebook into presenting the desktop version to me, once I move to a different area (notifications, messages, etc.) it throws me back to mobile on its own. Thank you for these options since Facebook decided to be stingy. Number 2 works for me perfectly, while number 3 unfortunately, they took that link away. I found out that if you're in the mobile-mode, and choose "request desktop site", it'll stay in mobile-mode but will allow you use your messages without having to download that stupid messenger app.